The History Behind the Defibrillator and How Far it has Come - First Edition First Aid Training Inc.
It’s amazing to reflect on how medicine and life saving devices have evolved over the last 100 years. Couple that with the advancement in technology and there’s no doubt that in the next 100 years, saving lives will become even more advanced and probable. One life saving tool that was invented and has evolved over time is the Automated External Defibrillator (AED). Evidence gathered by heart experts indicate that at least 522 lives can be saved annually in the United States and Canada, thanks to AEDs. Defibrillation is a medical term used to describe the process of restoring the regular pattern of muscular contraction in the heart or restarting the heart, when a person suffers cardiac arrhythmia, ventricular fibrillation and pulseless ventricular tachycardia. Defibrillation is done by using an AED on the exterior of the chest wall or directly to the exposed heart muscle. 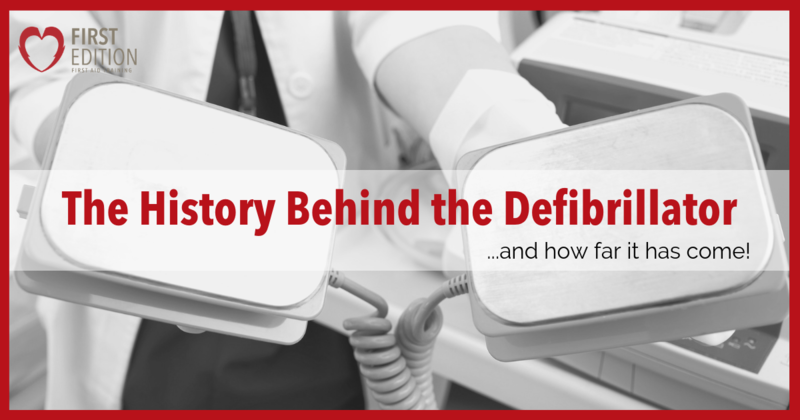 The defibrillator has a long and interesting history dating back to the late 1800s. What started as a science project on dogs evolved into one of the most important life saving devices used today. 1899: Physiologists Jean-Louis Prevost and Frédéric Batelli of the University of Geneva discover defibrillation by conducting tests using dogs. They induced fibrillation then defibrillated by administering high levels of electrical jolts. The results were not favourable due to the high levels of electricity being administered to the dogs. 1933: Thirty-four years later, an article appeared in Popular Mechanics about Dr. Albert S. Hyman and his “promising new invention,” the Hyman Otor. Dr. Hyman’s device, which involved inserting a needle with wires into the heart, was compared to “a self-starter for a car.” The needle stimulated the heart by way of electrical impulses. The device was tested only on animals was not accepted by the medical community for use on humans. 1947: The first successful defibrillation on a human was reported by American surgeon, Dr. Claude S. Beck. Dr. Beck successfully resuscitated a patient that went into cardiac arrest by using gauze-covered paddles similar to spoons to deliver a shock. This, in combination with cardiac massage and drugs, led to the successful resuscitation of the patient. 1956: Dr. Paul Zoll, a Harvard Cardiologist and widely considered an AED pioneer, successfully resuscitated two patients by applying electrical charges externally to the chest. 1965: Dr. Frank Pantridge, a professor from Ireland, invented the world’s first portable defibrillator, which used a car battery to generate electrical current. 1978: The first external AED was introduced. No one wants to have to experience a medical emergency, whether personally or with another person, but in the event that someone’s heart stops, having an AED at home or in your business can potentially save a life.